Sofia Richie & Scott Disick Couple Up During Vacay in Greece | Scott Disick, Sofia Richie | Just Jared Jr.
Sofia Richie and Scott Disick are enjoying their downtime in Greece! The 19-year-old model and 35-year-old reality star were seen while on a boat ride with pals on Tuesday afternoon (July 10) in Mykonos, Greece. Scott and Sofia went for matching white outfits as they made the switch from one boat to another. Later in the day, Sofia took to her Instagram to share a photo enjoying her time on the water. “Full blown,” Sofia captioned the photo, where her hair is blowing the the breeze. FYI: Sofia is wearing Prada Eyewear sunglasses. Sofia Richie and Scott Disick Have a Sweet Valentine's Celebration! Sofia Richie Goes Shopping After Jetting Home from Aspen! Sofia Richie Joins Boyfriend Scott Disick at the Derby! 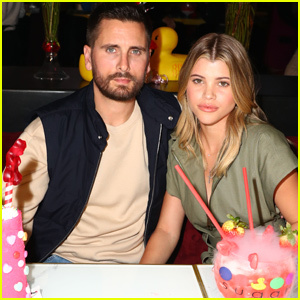 Sofia Richie Supports Boyfriend Scott Disick at His Australia Meet & Greet! Sofia Richie & BF Scott Disick Hang Out on a Yacht in Australia!